From the Troopers' Web site: The Troopers' design team of Tom Rarick, Mitch Rogers, Doug Thrower and Scott Koter met in November in Indianapolis, with corps director Fred Morris to put the finishing touches on the corps' 2007 show concept. 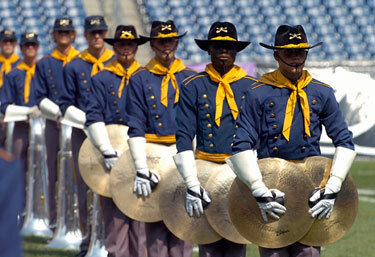 Troopers at the 2005 DCI World Championships in Foxboro, Mass. The Troopers are proud to present its 2007 program, "Awakening" featuring the music of Joseph Curiale, Dave Brubeck and Gordon Goodwin. The appropriately titled offering will allow the corps to celebrate its rich heritage while paving the way for the future as "America's Corps." Learn more about the 2007 Troopers on www.troopersdrumcorps.org.